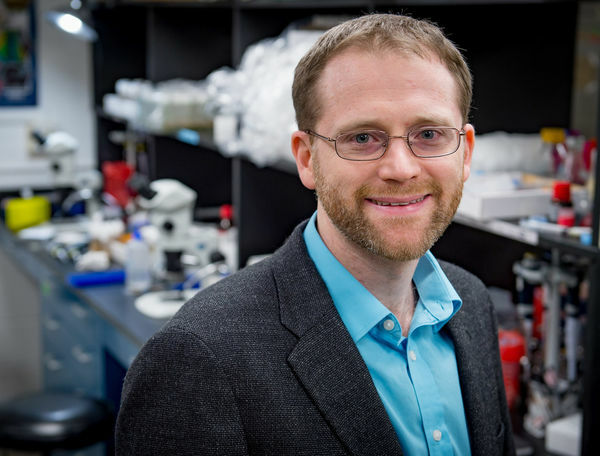 Jeremy Zartman, Assistant Professor of Chemical and Biomolecular Engineering and affiliated member of the Center for Stem Cells and Regenerative Medicine, has been awarded a competitive Maximizing Investigators’ Research Award (MIRA, R35) grant from the National Institutes of Health. The MIRA program is intended to provide research support for "the nation’s highly talented and promising investigators”. Zartman’s 5-year grant entitled Regulation and Function of Multicellular Calcium Signaling in Epithelial Growth and Regeneration will support an investigation of impaired cellular calcium signaling, prevalent in many diseases including skin diseases, Alzheimer’s, and metastatic cancer. The cell’s internal “computer” uses calcium ions as messengers to help calculate its response to environmental stimuli. This requires regulation of calcium ion concentrations in cells to coordinate cellular processes. However, much remains unknown about the functions of time-varying calcium signals in developing or regenerating organs. Zartman’s research program seeks to discover the biochemical and mechanical basis of integrative cell communication mediated by calcium signaling. A long-term goal of this research is to learn how to manipulate calcium signaling to control cell growth, motility, death or function. This knowledge will enable new ways to target cancer cells to die or to stop metastatic cells from spreading. This work can also inspire methods to regulate cell differentiation for stem cell engineering applications. Originally published by Khoa Huynh at harpercancer.nd.edu on August 30, 2017.